Burlington High School Principal's Blog: BHS Spring Sports Update - Red Devils Start Post Season Strong! BHS Spring Sports Update - Red Devils Start Post Season Strong! 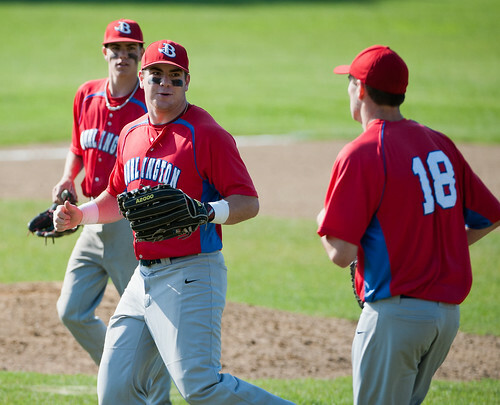 Kyle Shields homered twice yesterday to lead BHS past Boston Latin. Both the Boys Lacrosse and Baseball teams were winners in their tourney openers. The Baseball team pounded Boston Latin yesterday 17-6 thanks to two homers by senior Kyle Shields. The team will travel to Danvers Monday for a 6:30 game. Meanwhile, the Boys Lacrosse team will be at Winchester for a second round game today at 5 p.m., following their 15-13 win over Beverly Wednesday. In other acton today, our softball team will open post season action today with a 4 p.m. game against Newburyport on their home field (Marvin Field). The Girls' Tennis Team also gets started in Eastern MA North Tourney action, hosting Reading today. Rounding out the weekend slate, the BHS Boys Tennis will begin its post season run tomorrow when they host Medford.